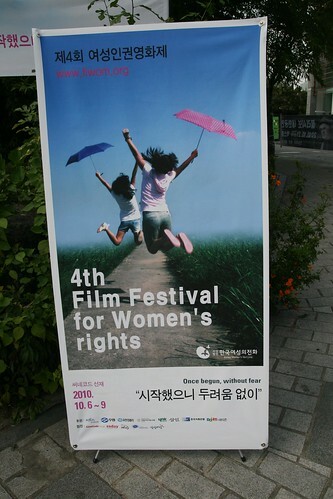 In case you didn't know (because I had no clue) today is the start of the 4th Film Festival for Women's Rights. Just a short walk from Anguk station at the Artsonje Center this small vibrant festival kicks off today and runs through to Saturday night. Featuring home grown and international short films, documentaries and feature length flicks it's a great chance to see some interesting films that can't be seen anywhere else. Unfortunately the website (see the blue link above) is mostly in Korean, but if you click the little alarm clock in the bottom left hand corner it will take you through to the screening schedule where the films are listed in both Korean and English. Click on the film you're interested in and it will take you to a bilingual synopsis/description. Highlights include a screening of the beautiful animation Persepolis on Saturday at 12.30 (French with Korean subtitles, sorry no English available) and the closing film Say My Name - a look at the male dominated world of R'n'B and the female lyricists who are pursuing their passions as MCs.